Help us Save Our Girl Scout Camps! (soscamps) Please consider a financial donation to help us help you. We are a group of GS Alumni/Lifetime Members working to prevent the Girl Scout Council of Eastern Iowa / Western Illinois (GSEIWI) from selling their 4 remaining camps. Once these camps are sold, the girls will never get them back. We are using the legal system to prevent these sales and the legal system is expensive. With your help we can continue this fight. The local District Court ruling finds agreement with the GSUSA representative that testified that GSs do not need camps. Without legal intervention, and even with the GSEIWI property plan continuing changes - we believe the camp properties are still at great risk of being sold. There is an ongoing effort now to determine not "if" but which lands will be sold when. Our lawsuit asked GSEIWI to allow the MEMBERS to vote on such an important decision as selling camps. They refuse, asserting that only the Board is responsible enough to make such a decision. That's right, not only does GSEIWI refer to you as a Volunteer and not as a MEMBER (because MEMBERS have rights) but they also believe that its members are not engaged enough, and not responsible enough to make such a decision as if camp properties should be sold. (See WHBF Article) Let them hear your VOICE! We believe fully that the Council does have the money to support these camps - they choose not to. Help us continue our efforts to communicate that girls DO want to camp and the Girl Scouts is the place to do that! We need your financial help! Any funds received over/above our legal expenses will be provided to other similar legal cases around the United States - and there are plenty that need our help. For more information please visit the SOS Camps website (above) or find us on Facebook at SOS Camps. 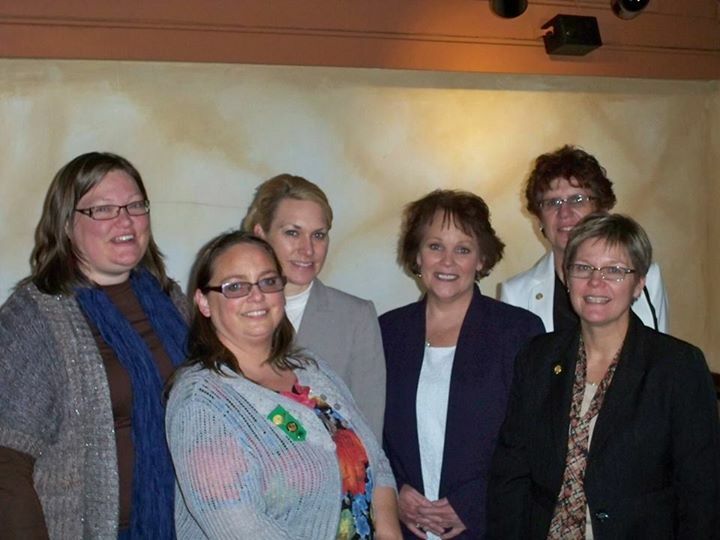 The Girl Scouts of Eastern Iowa Western Illinois (GSEIWI) Annual Meeting is a little over a week away. Why is this important you ask? 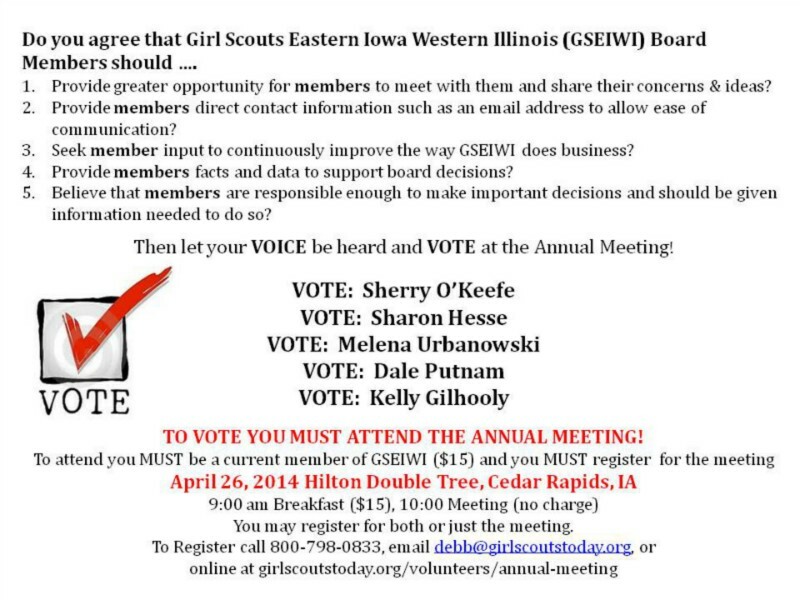 Because this meeting is the ONE time a year that GSEIWI MEMBERS can have their VOICE heard and VOTE on who they want representing them on their Board of Directors. I know you are busy but if you care about what is happening with Girl Scouts this is the single most important thing you can do to support change! VOTE in Board Members who you believe will listen to you! Breakfast at 9:00 ($15). Business meeting at 10:00 (no charge). You may attend only the business meeting if you choose. You MUST RSVP to: Deb Boyd, email debb@girlscoutstoday.org or call 800-798-0833. Your GSEIWI membership must be current ($15 annual membership fee). Register online at https://gsusa.ebiz.uapps.net/vp/Default.aspx?pid=36 Be sure to print your new membership card when complete. See you Saturday April 26th! Help us Save Our Girl Scout Camps! Please consider a financial donation to help us help the girls of today and tomorrow. We are a group of GS Alumni/Lifetime Members working to prevent the Girl Scout Council of Eastern Iowa / Western Illinois (GSEIWI) from selling their 4 remaining camps. Once these camps are sold, the girls will never get them back. We are using the legal system to prevent these sales and the legal system is expensive. With your help we can continue this fight. Without legal intervention the camp properties are still at great risk of being sold. Our lawsuit asked GSEIWI to allow MEMBERS to VOTE on selling the camps. They refuse, asserting that only the Board is responsible enough to make such a decision. That's right, GSEIWI believes that its MEMBERS are not engaged enough, and not responsible enough to make such a decision as if camp properties should be sold. (See WHBF Article) Let GSEIWI hear your VOICE! Help us continue our efforts to communicate that girls DO want to camp! We need your financial help! Girls DO want to camp! Michael Brandwein, noted speaker and consultant to the camp profession, said, "What makes camp a special community is its focus on celebrating effort. In this less pressured atmosphere, children learn more readily what positive things to say and do when they make mistakes and face challenges. 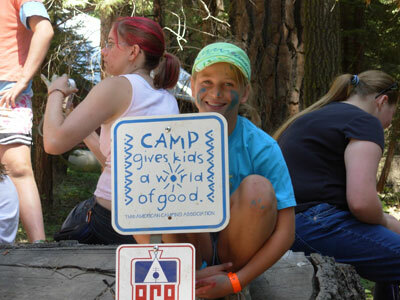 Brandwein also said, "The traditions and customs of each different camp are like a secret code that allows those who know it to feel embraced by something unique and special." He continued, "Campers are urged to include, not exclude, others. They are praised for choosing new partners and not always the same ones. They are encouraged to respect the differences between people. In an increasingly sarcastic, put-down-oriented world, camps aim to be an oasis of personal safety where demeaning comments and disrespectful behavior are not tolerated, and children are taught responsible and positive ways to resolve conflicts." Unfortunately it costs money to fight for the survival of these camps! Please send a donation today to help defray the legal costs associated with this fight. And please share this email/update with those you know! The GSEIWI Annual Meeting will be held on April 26th. 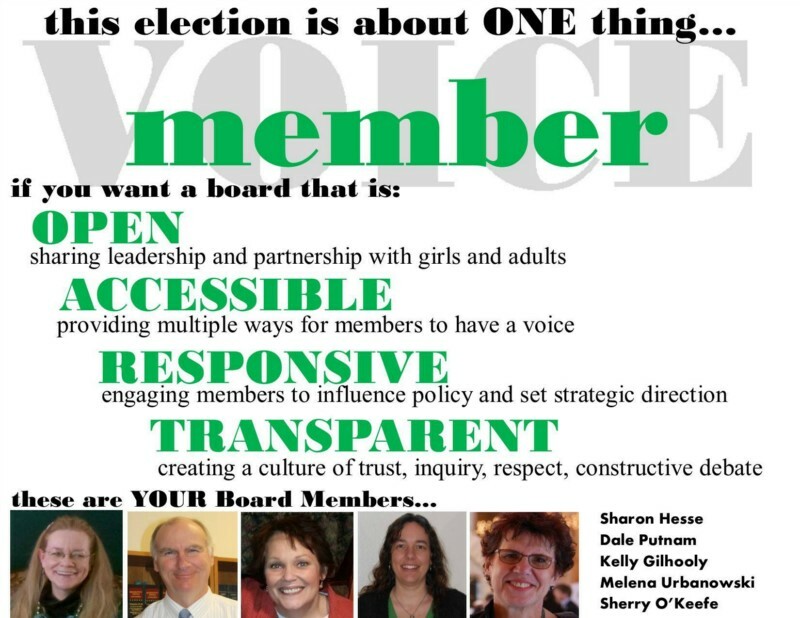 This is an opportunity to vote in Board Members whom you believe will be responsive to you! Take a look at this flyer .... and you decide! What a great idea to Take Action for the girls of Girl Scouting - now and in the future. I will be sharing this information all over. Also, if you know people who will give to this worthy cause, please let them know. And if you are a Grant Writer, contact her about that too.